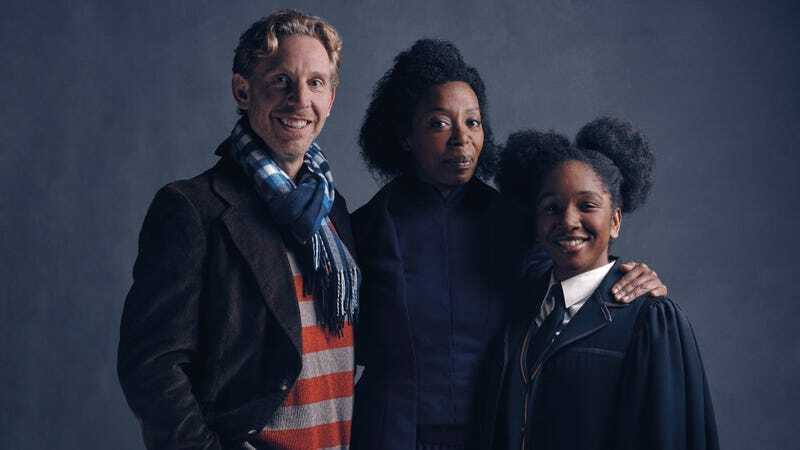 We got the Potters yesterday, and today brings us the rest of Harry Potter’s power trio: Hermione (Noma Dumezweni) and Ron (Paul Thornley) with their daughter Rose (Cherrelle Skeete). Like last time, Pottermore has J.K. Rowling and the actors talking a bit about the play. There’s a bit more detail on the Granger-Weasleys than there were on the Potters, though. For example, Rowling says that “Ron in his forties isn’t very different from Ron in his teens, except that his feet hurt a bit more.” Thornley says that everything about Ron’s costume is about comfort and they’ve picked out what they think of as Ron’s “favorite” sweater for the costume.